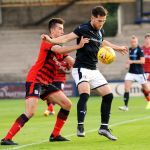 Raith Rovers lost their second Betfred Cup Group C match in succession, but only after an incredible finish to their match against Dundee at Stark’s Park this evening. 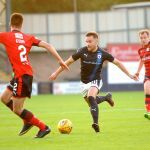 An excellent last-minute goal from Lewis Vaughan, had appeared certain to take the match to penalties, after Soufien Moussa had given Dundee the lead after 83 minutes. 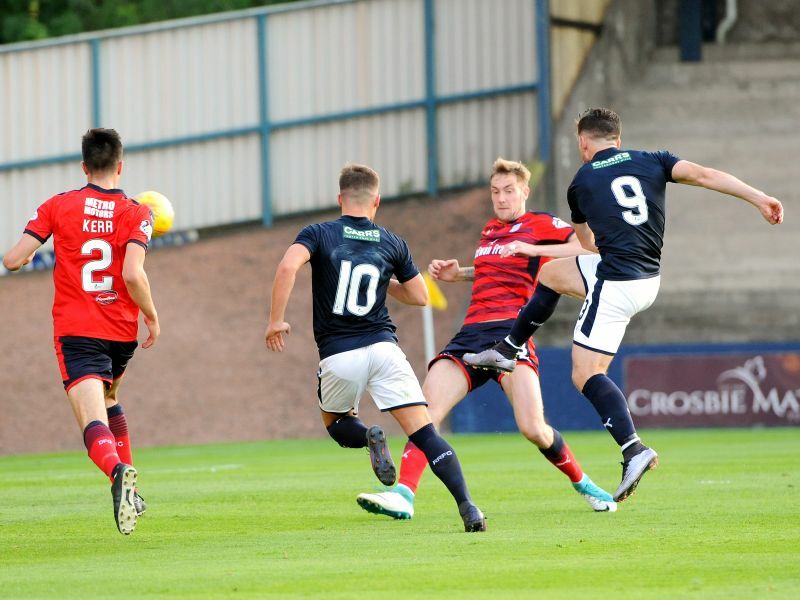 However, a goal two minutes into injury time from Jack Hendry handed Dundee all three points, in an entertaining match, that Raith Rovers again gave a good account of themselves in against higher ranked opposition. Barry Smith made just one change from the defeat to Dundee United, with Bobby Barr dropping out of the squad altogether, allowing Yaw Osei to make his first ever competitive start for the club. As expected, Dundee were looking slick in the early stages, with Faissal El Bakhtoui the focal point of the attack and Scott Allan in behind, while Randy Wolters and Rorie Deacon were providing the width and pace out wide. 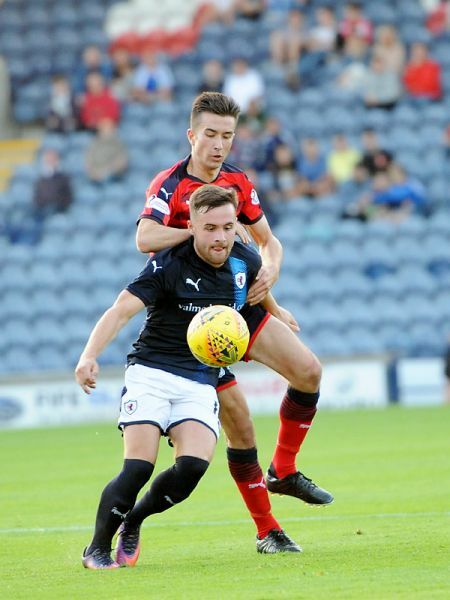 Considering the options that Dundee had, Rovers were going to have to go about their business in a rigid and organised fashion, but a slightly short pass back by Iain Davidson after five minutes, almost gave El Bakhtaoui a sniff at goal, but Aaron Lennon was alert enough to clear. 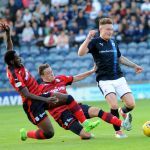 Despite Dundee’s bright start, Rovers remained resolute, and tentatively started to grow into the match themselves as the half wore on. 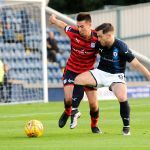 They created their first chance after 20-minutes, when Buchanan was handed possession 30-yards from goal, but after striding forward purposefully, his 25-yard bobbler was easily scooped up by Scott Bain. Rovers were now starting to cause some problems of their own, and Vaughan possibly should have done better from the edge of the area after being fed by Spence, but the ball seemed to get caught under his feet a little and he failed to muster much pace on his effort. Buchanan was the next to threaten, when he cushioned a header across goal from a Vaughan set-piece with his first touch, before rifling a shot at goal with his second, only to see Bain gather comfortably. 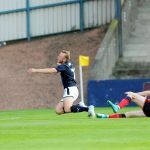 However, while that was a close run thing for Raith, Dundee created the best piece of football straight on the counter, in what was the final piece of action in the half. Allan’s cross, deep from the right, found Wolters in some space outside the area, and despite being forced outside by Ross Callachan, he still found the angle to rattle a stinging drive off the right-angle of Lennox’s goal-frame. 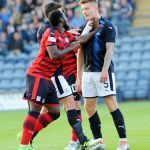 Dundee, perhaps geed up by Neil McCann’s comments during the interval, were straight on the offensive in the second period, with Mar O’Hara and Wolters exchanging passes, before feeding Cammy Kerr out wide. His cross to the edge of the penalty area was a good one, and possibly deserved better than Deacon’s volley into the away stand. Within 10 minutes of the restart though, Rovers missed the best chance of the match. Vaughan did well to both gather in a throw-in under pressure, then make inroads towards the area, and while his ball inside to Buchanan initially appeared to be breaking down, it eventually sat up just right for the former Livingston player, who pulled his shot high and wide with Bain exposed by his defenders. 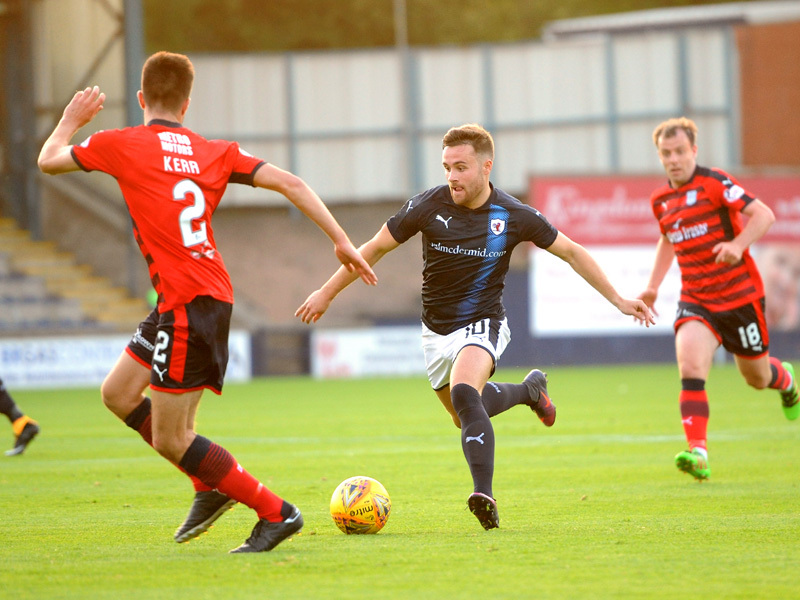 The second period had become a real ding-dong affair, with little quarter given or asked, with the Dundee players, or certainly Paul McGowan and Bain becoming quite rattled midway through. First, McGowan became irate at being asked to leave the field for treatment after claiming he’d been elbowed, then Bain was furious at Greig Spence, who was already on a booking, after he’d claimed the forward had dived in the box. 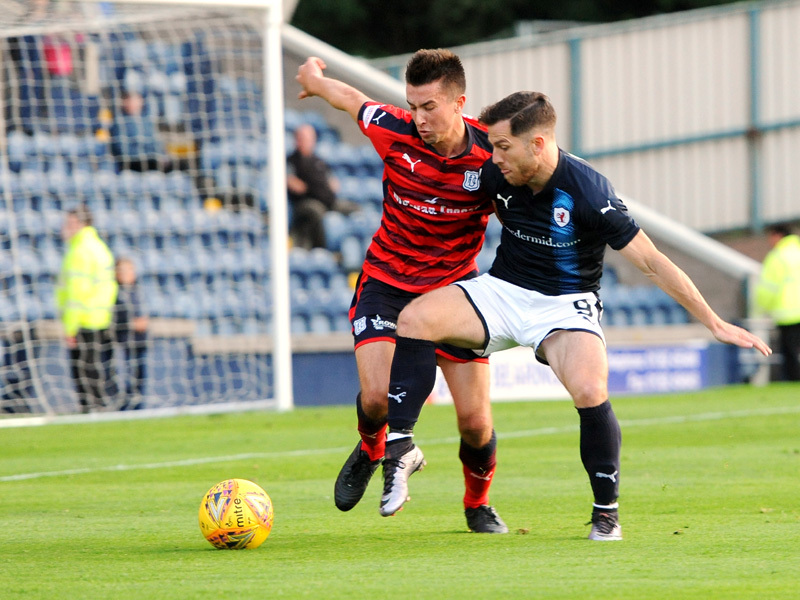 However, the incident had appeared neither a penalty nor a dive, with Kevin Holt getting back well to challenge the Raith forward as he looked to shoot. Barry Smith brought on some fresh legs as the half wore on, with Osei departing for Ross Matthews and Spence making way for Jonny Court, but as the minutes ticked down, Rovers appeared to retreat slightly deeper, albeit Dundee weren’t exactly penning them in, with Darren O’Dea’s looping header from a Kerr cross, one of their few threatening moves in the half. That would all change in a madcap final few minutes though. Allan’s free-kick in the 83rd minute, was poorly defended in the penalty area by the home side, allowing Moussa, who had recently come on as a substitute, to stab home from close range, prompting wild scenes in the away end, with the Tunisian presumably one of the few players to be booked for jumping on top of a wall as he celebrated his strike. 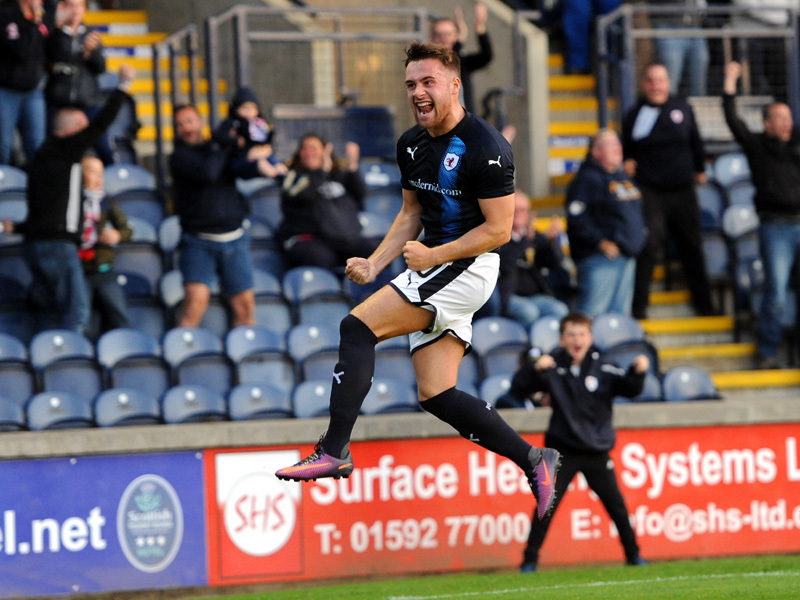 It was a tough blow for Rovers, but to their credit they turned the screw on their Premiership opponents during the closing spell, eventually equalising in the 90th minute with a brilliant leveller. Callachan was involved to start with, laying the ball towards Euan Murray who’d ventured forward on the left-wing, and he slipped off the shackles of his marker with a clever dummy, before delivering a cross into the area which Vaughan half-volleyed past Bain from just inside the area. It was a goal that Raith had thoroughly merited, and they almost won it just a minute later, when Buchanan had two bites of the cherry to cross it into the area, with his second attempt finding Matthews who had timed his run into the area perfectly, but he could only direct his shot disappointingly at Bain from close range. 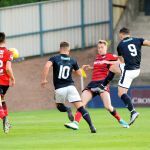 If that was a disappointment, then what was to follow was even worse, as Dundee regained the lead with virtually the last touch of the fixture. McGowan’s cross into a congested penalty box was a good one, and Hendry leapt higher than anyone to power a header home, with Lennox beaten. It was a harsh close to proceedings for the home side, who now face a weekend off, before heading to Buckie Thistle on Tuesday evening. Welcome to Starks Park for our group C encounter against Dundee, it's 20 degrees and sunny. Bobby Barr out injured and Yaw Osei takes his place. 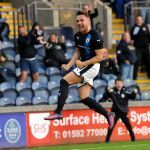 Euan Valentine gets a place on the bench. Deacon and Murray having an early grappling session. El Bakhtaoui robs Robertson and seconds later the Rover reciprocated. Allan breaks through and Lennox runs out of the area to clear. Allan and Wolters with a set piece almost catch Lennox at his near post. Dundee interrupt a breakaway O'Dea fouling Osei. Both sides pulling out of tackles, wise given the high tempo of the start. 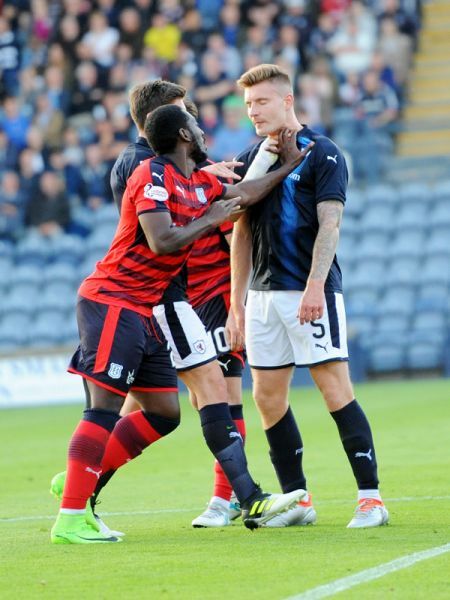 Mr Finnie hasa word with Benedictus after a challenge on Allan. Buchanan strikes from outside the area, hits Spence and the ball rolls towards Bain. Buchanan lays off to Callachan who saw his shot cannon of a defender. Latest score, Raith Rovers 0-0 Dundee, neither side have had a clear shot on goal so far. Thomson squares to Spence, lays of to Vaughan whose shot is palmed away by Bain. Buchanan closed down as he turned to shoot on goal. Kerr puts Bain on the spot as he passes back from 5 yards. El Bakhtaoui teasing the Rovers defence, Thomson heads away his lobbed shot. Thomson back tracks to block Wolters run, Lennox dives to cover the ball. Spence and Buchanan desperately trying to make inroads against a stout Dundee defence. Deacon gets the blues as he sclaffs at a shot. Robertson taking a blow to the head in a clash with O'Hara. Wolters hits the junction of bar and post with a shot from 8 yards. Thomson throws himself at the ball as it comes in from a corner to bravely clear. Spence yellow for simulation as judged by Mr Finnie. 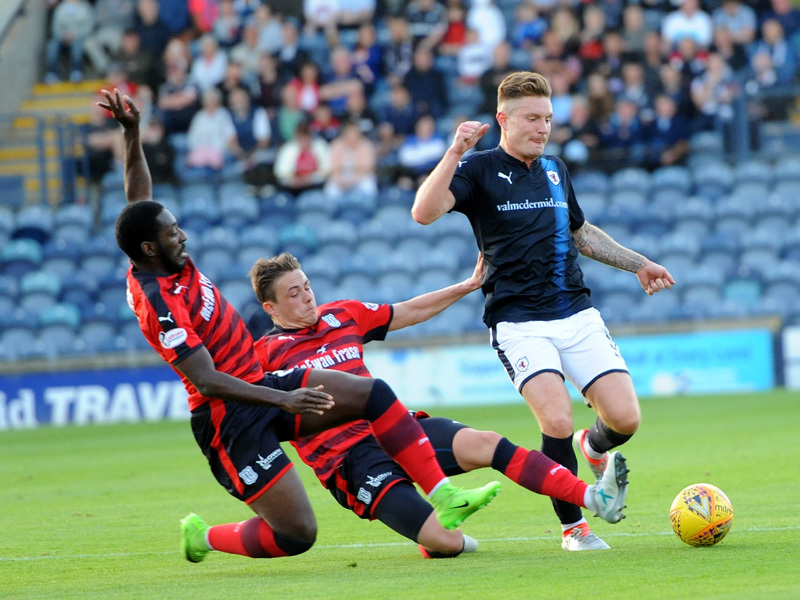 Half time, Raith Rovers 0-0 Dundee. Rovers restart, shooting towards the South Stand. No changes at half time. Ths ball skirts about the edge of the area and Deacon fancies his chances but fired over the bar. Osei chasing a loose ball but Bain is alert and gathered. Buchanan and Vaughan with a 1-2, Buchanan slices the ball just wide. Mr Finnie has a word with Mr Smith. We waited an age for Dundee to take a free kick and Allan nearly kicks it out of the park. Deacon barging Murray only received a talkin to. Deacon going down in a clash with McGowan, the latter reacts badly and is spoken to by Mr Finnie. The Dundee pair return to the field. Spence is brought down in the box but received no sympathy from Mr Finnie. Deacon reacts to a cross and fires just over the bar. Deacon, a long overdue yellow for a foul on Buchanan. Rovers have their dander up. Vaughan hoofs the ball into the South Stand. Moussa in a move from Stricktly, shuffles 3 times but couldn't get the shot off. McGowan and Allan combined, the cross from the latter is picked off by Lennox. Murray whips in a cross, Spence heads and the ball goes just wide. The floodlights come on to illuminate the proceedings. Holt and Court yellow for a clash. Goal Dundee. Moussa turned a fired home from a free kick. Vaughan feeds Court at the near post but Bain dives to save. Vaughan floating a free kick into the box meets Murray who heads wide. A nice turn from Court saw him find Vaughan who volleyed home from 6 yards. Matthews nearly steals it with a six yarder. +3 Speculation that it was a Hendry header. +4 Full Time. Raith Rovers 1-2 Dundee Hard lines on the result, Rovers deserved something from that performance. El Bakhtaoui now receiving credit for the goal. Lennox, Thomson, Callachan, Murray, Benedictus, Spence, Robertson, Buchanan, Vaughan, Davidson, Osei. Subs, Brian, Matthews, Court, McKay, Berry, Thorsen, Valentine. Bain, Kerr, Holt, O'Dea, Kamara, Allan, O'Hara, El Bakhtaoui, Deacon, Hendry, Wolters. Subs, Ferrie,Moussa, Williams, McGowan, Spence, Wighton, Waddell. 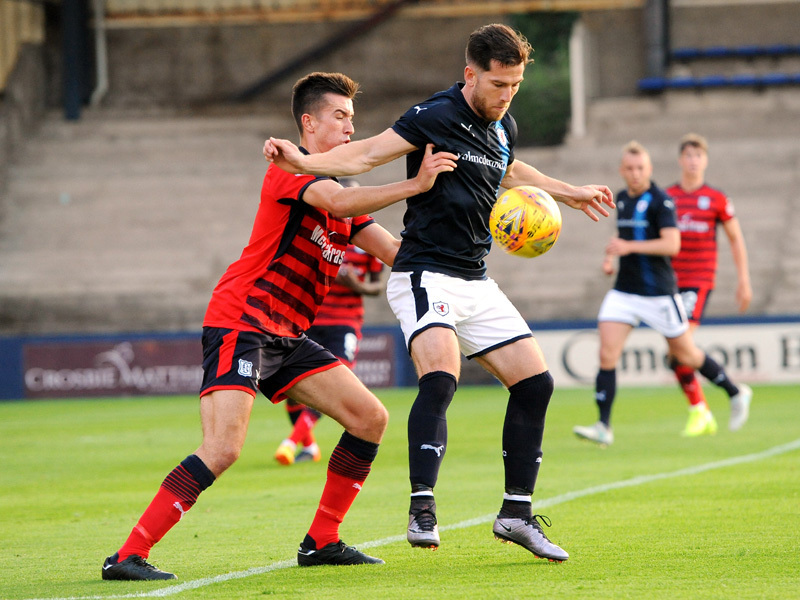 After losing to Dundee United on Saturday in the opening match of their Betfred League Cup Group C campaign, Rovers will be hoping for a better result, when they welcome Dundee to Stark’s Park on Tuesday evening. This will be Dundee’s first match in the group, after they had a free weekend, with the other group fixture seeing Cowdenbeath defeating Buckie Thistle 4-2. 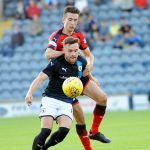 After initially rejecting the chance to continue to be Dundee’s manager, then experience a change of heart, Neil McCann has had a busy time in the transfer market over the summer, with seven new arrivals at Dens Park. Central-defender, Jack Hendry has been signed after leaving Wigan, while three central midfielders have been added to the pool, in Glen Kamara, Scott Allan and Lewis Spence, who have joined from Arsenal, Celtic and Dunfermline respectively. Two left midfielders have also signed up, with Roarie Deacon acquired from Sutton United, while Randy Wolters was picked up after he was released from Go Ahead Deventer. Up front, Souffien Moussa may make his debut, after signing on Friday from FC Lokomotiv Gorna Oryahovitsa who ply their trade in the Bulgarian second-tier. 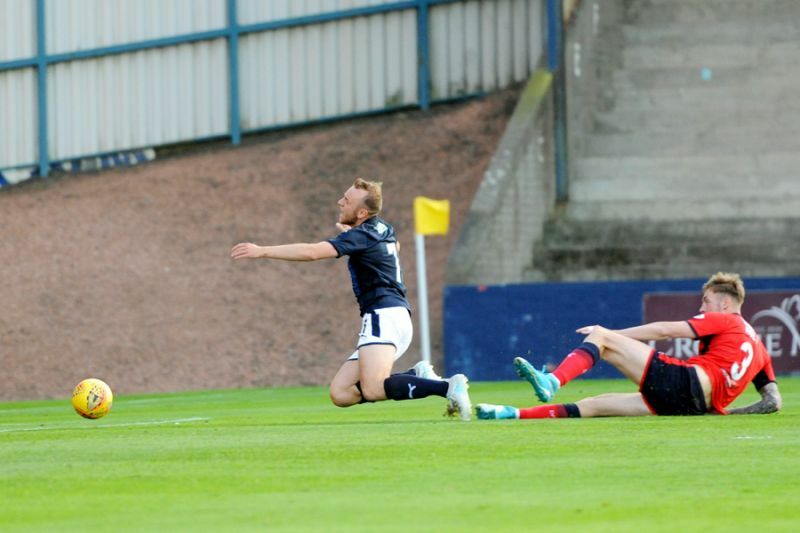 The clubs last meeting was also in the League Cup in 2014, when Dundee were comfortable 4-0 winners in a second round tie at Dens Park. Raith’s last win over Dundee was at the same venue a year earlier, when an own-goal from Gary Irvine gifted Rovers a spot into the fifth round of the Scottish Cup. You have to go back even further for Rovers last win over the Dee at Stark’s Park though, 2011 to be precise, when a Gregory Tade effort and a last-minute Allan Walker goal saw Rovers run out 2-1 winners in a First Division fixture. The aforementioned Scottish Cup game is Raith’s only win from the teams last ten meetings, with six defeats coming in that sequence. Tuesday evening’s match referee will be Stephen Finnie.